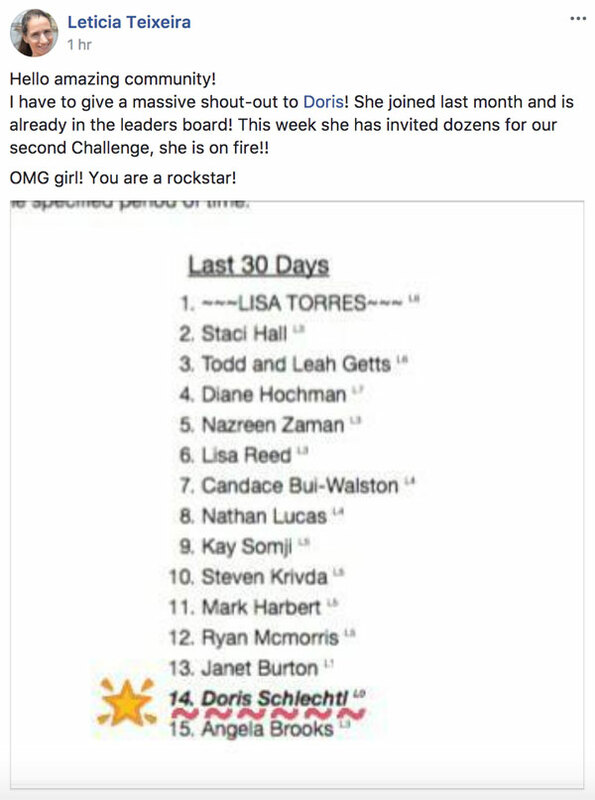 Lisa Torres has been absolutely crushing it with her Facebook Challenges since November 27th! Those are some awesome numbers. Not to mention that she's built a FB group of 1098 members. Basically she's using the Attraction Marketing Formula right before our eyes, building an audience, engaging with that audience, and selling to that audience. Doris Sclechtl has hit the leader boards in just a month. 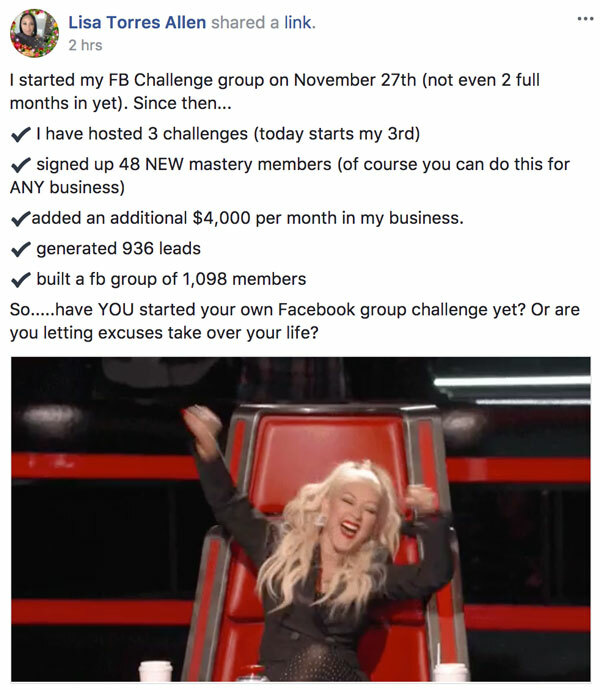 Those darned Facebook Challenges seem to work like gangbusters! Her challenge partner Leticia Teixeira was so proud she had to give her a shoutout in the MLSP community this week. Best community ever! Great job Doris! 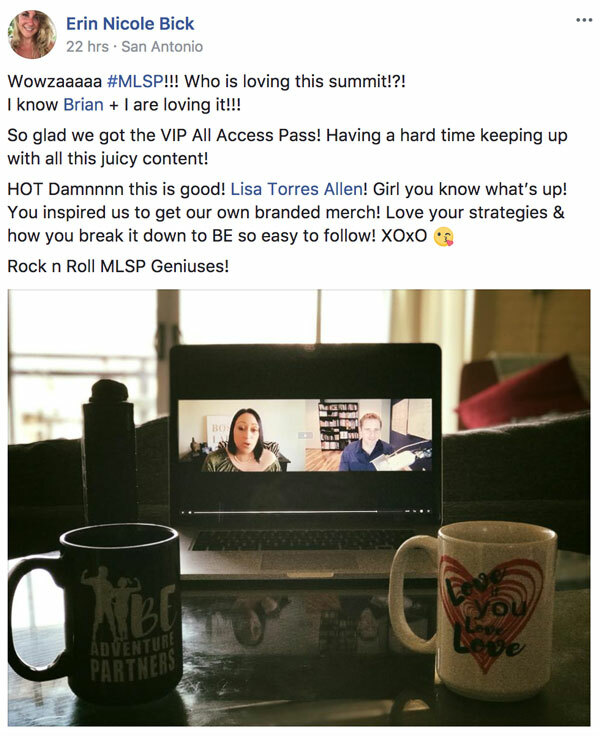 Erin Nicole Bick is having a tough time keeping up with all the juicy content that's happening inside the MLSP Attraction Marketing Summit! Good thing they decided to go VIP and Get the All Access Pass! There ya go. If you've missed any of the Summit Session, they're gone for good. But you can still get VIP LIFETIME ACCESS to ALL 40 of the sessions HERE! Kaunda Mabuya has a great head on his shoulders? Why? Because the next thing he said was absolute truth. This is a guy who gets it, and looks like if he keeps doing what he's doing, he will get the life he's after. Great work Kaunda! 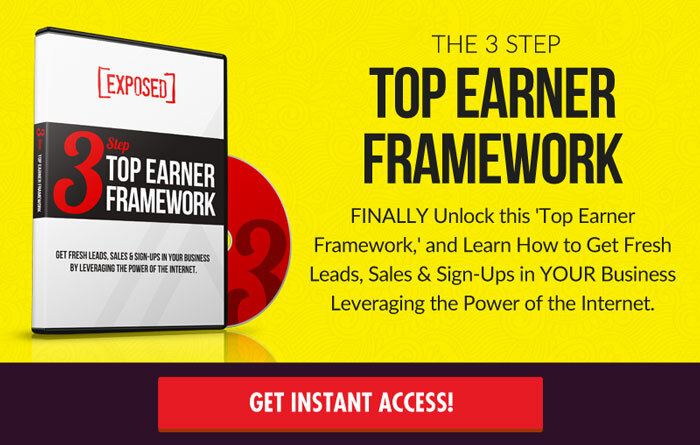 Start putting everything you're learning into action and BOOM! We can't wait to see you on the leader boards! Looks like this has been a win/win for Mike Capricciuolo! All the valuable sessions PLUS commissions! Doesn't get better than that. Jean-Serge Gagnon is seeing the power of ManyChat in action. Those open rates are pretty standard when you use Facebook Messenger and ManyChat. 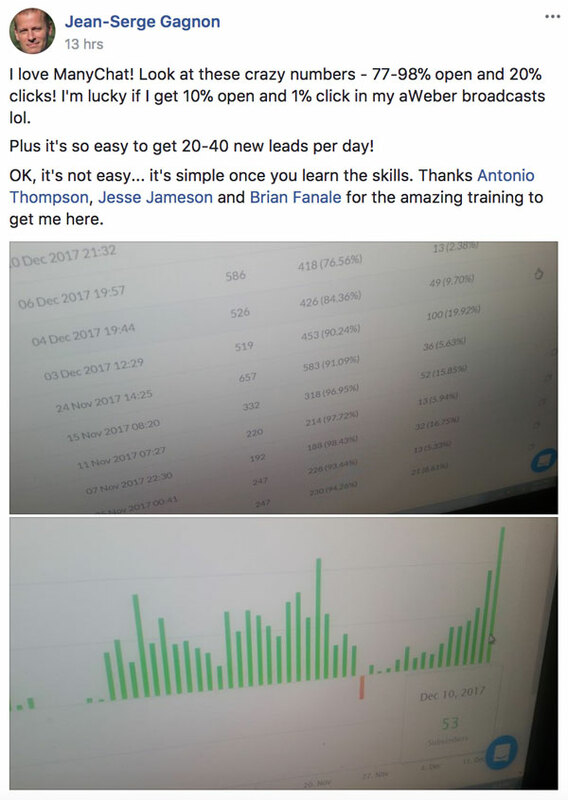 “Plus it's so easy to get 20 -40 new leads per day! This dude is killing it from so many different angles. Mohamed Rachadi is seeing what so many others are. That the Attraction Marketing Summit has been amazing so far. Not us, we're just doing the interviews. It's the leaders that are delivering insane amounts of value! Thank you Mohamed, and thanks to all the speakers on the Summit! Wow! 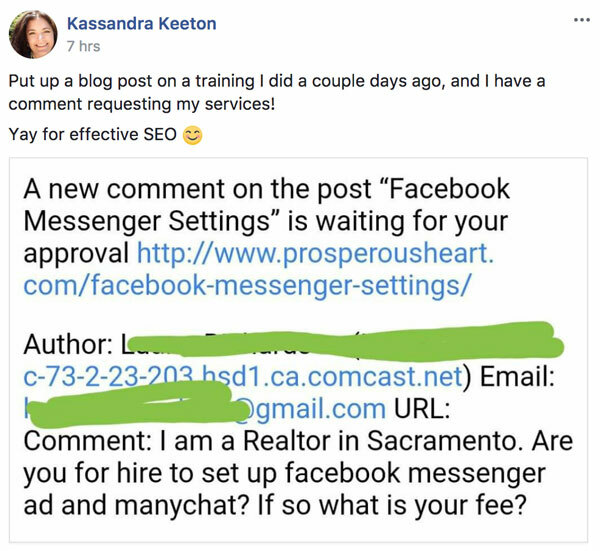 Kassandra Keeton made quick work from one of her blog posts this week. Danny Reardon is seeing how quickly you can get results when you make the right moves. He's doing the work. Great things likely to come for this guy if he keeps it up. Judith Ritz watched Kate McShea's interview on the Attraction Marketing Summit and got ultra-inspired. Can't wait to see what happens next for Judith. Judy Robin Gunn is excited, and she should be. First leads are amazing. She did this with the FREE strategies we share here at MLSP. 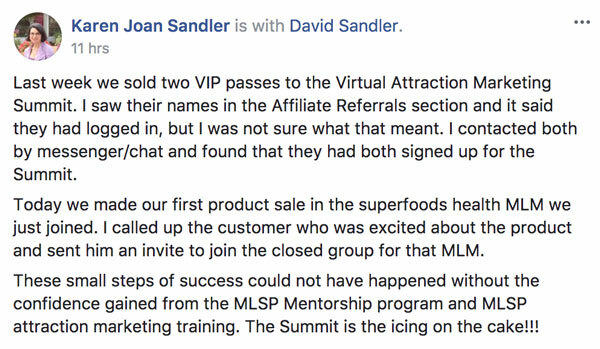 Karen and David Sandler are winning with the Attraction Marketing Virtual Summit affiliate program. Two VIP passes is some nice change, and it's great to see them making money over the holidays. They're also making fast progress with their newest MLM company. Looks like they're using the Attraction Marketing Method that MLSP has been teaching with tons of success stories for nearly a decade. Awesome to see these two doing so great so fast! Shoutout! 2 New Mastery Members in MLSP, 1 New Retail, and 1 New VIP Customer into Her MLM! Boom! Georgianna Garcia has gotten the attention of the great Steven C. Krivda. He gave her a huge shoutout inside the MLSP Community this week. We agree with what Steve in his post. SHE IS AMAZING!! 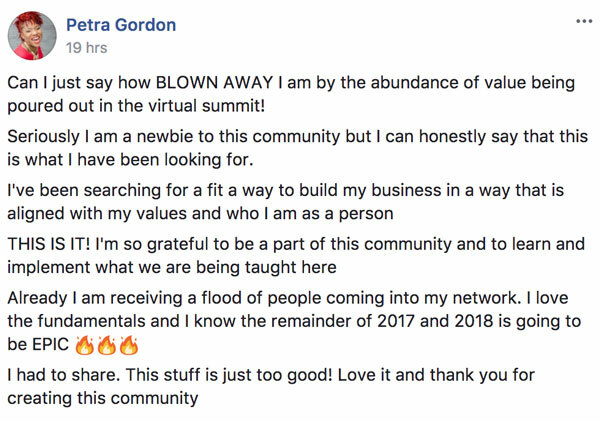 Petra Gordon is liking what she's seeing in the Attraction Marketing Virtual Summit. As are WE! This summit is epic, and the success stories that will come because of it will be even more so. We're thinking that Petra will be one of them. Wait. 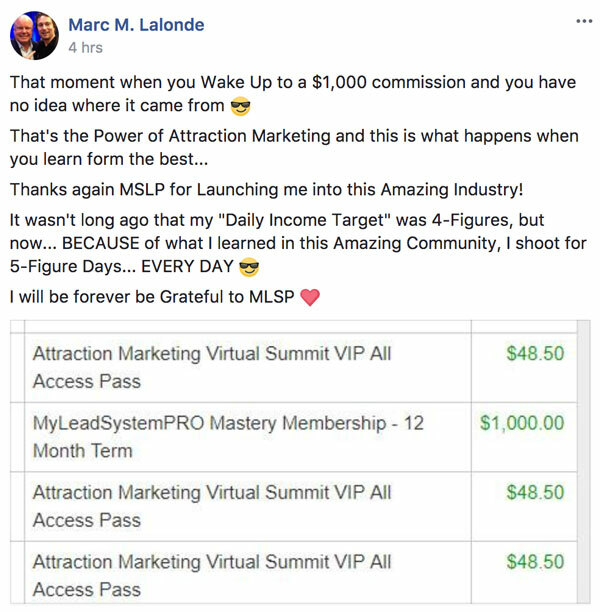 Marc M. Lalonde still gets excited over $1000 commissions?? Of course he does. 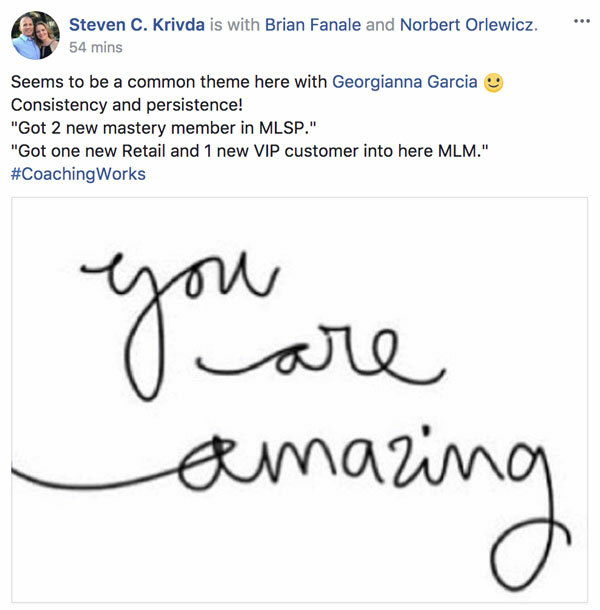 This dude is a marketing machine, and we're grateful for the nice things he had to say about MLSP inside his success post this week. Thank you Marc for calling MLSP home!! 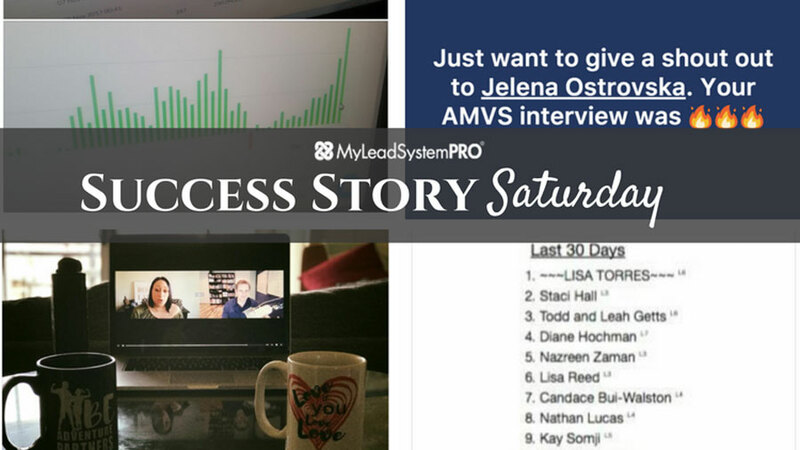 Go check out these and all the other success stories below! Get the gold from these stories so you can create your own! !